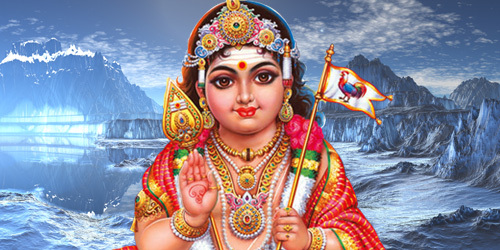 Vaikasi Visakam is the grand celebration of Lord Muruga’s Birthday in the Vedic month of Vaikasi when the full moon coincides with the Vishakha Star. This Year Vaikasi Visakam falls on June 3rd IST and in the morning, the Moon will be in the star of Vishaka, the star of success, and ultimate winner. It is so appropriate that Vishaka is Muruga’s own birthstar as he is the warrior/healer archetype who brings strength, self-confidence and leadership in any area of your life. He empowers you with winner’s consciousness, especially in your profession or work. The Star “Vishaka” is considered to be very auspicious, as most of the saints, geniuses and great people like Buddha were born in this Star. Muruga born in this Star is referred to as Gnana Pandita, which denotes the authority on wisdom. Lord Muruga is the chief commander of the great divine army, a fine and a fearless defender of righteousness. You can access the energy of Lord Muruga by learning the secret of Powerful Mantra “Om Saravanabava”. It signifies the 6 syllables which represent 6 aspects of life and are dedicated to the 6 faces of Lord Muruga. SA – Gains you the ability to attract all people to your side. VA-Wash away your physical discomforts, debts and competitions. NA-Surmounts your problems through enemies. 6 is a powerful number associated with Lord Muruga and we are offering a Grand Group Homa (Fire Ceremony) to be conducted by 6 trained priests at AstroVed Center in Chennai. They will energetically chant various sacred sounds and place offerings into the fire to bring in many aspects of Muruga on behalf of the sponsors. Their efforts will open a wide doorway for Muruga to shower his blessings onto the earth plane. Special rituals at Sri Muthukumaraswamy Temple (Vishaka Star Temple) and a FREE homa at AstroVed center will also be a part of Vaikasi Visakam 2012 celebrations. Offer your sincere prayers to Lord Muruga who can eliminate all the negative forces from your life and bless your life with wisdom, strength & prosperity.